John Wick (Keanu Reeves) is back in this action-packed sequel. If you haven't seen the first one, I suggest you watch it to understand some things that go on in this film but you can catch on either way. John is part of an organization of highly skilled assassins and to be in such a group, there are rules he must follow. We all thought he was done in the first but an old acquaintance comes to see him to repay a debt. A debt that must be repaid or there will be consequences. With an R rating, John Wick 2 is not a movie for the light-hearted. In the first movie, John's kill count was in the 70s. From what I've found online, he's well beyond that this time around. There are a lot of brutal but precise deaths either with his hands, guns, and even a pencil. I've never liked that some movies have guns that never run out of ammo but John Wick is realistic. He has to reload every time and when he does run out of bullets, he uses the guns of his victims. The stunts are all done by Keanu himself and it was a great way to show the realism of the choreography involved in his fights. 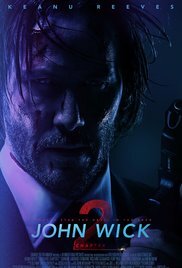 John Wick 2 keeps you on the edge of your seat with gory deaths, action throughout and a story that does not falter. You dive deeper into John Wick's world and it is fascinating. There are rumors that a chapter three is already going to happen and with the way 2 ended, John Wick is in a whole lot of trouble. Totally worth watching and I had a great time, I'm sure you will too and I cannot wait for the next one!